Travel Thru History Alice? Alice. Who the heck was Alice Paul? / Quick History / Alice? Alice. Who the heck was Alice Paul? On January 11, 1885 on a large Quaker farm in New Jersey, the Paul family welcomed their first child, Alice. Although many farm girls of her era boasted a muscular build, Alice was always slightly framed. She didn’t convey an image of physical strength, but her character was one of the toughest the women’s suffrage movement would encounter. Alice’s mother was a part of the suffragist movement, as were many Quaker women of the time. Quakers believed in equality, and worked hard to achieve it. This was true in education as well as in voting rights. In 1864, Alice Paul’s grandfather, Judge William Parry, had helped found Swarthmore College. Her mother Tacie attended the institution, but as married students weren’t allowed at the time, she dropped out after marrying at the end of her third year. She also made a promise to herself that all of her children would get the same opportunity. Alice Paul entered the school in 1901, and while there she flourished as a scholar. Her undergraduate degree was in biology, but Alice was interested in many subjects, served on student government, and was named an Ivy Poetess. She was an excellent scholar and after completing her degree, decided to continue her education in practice in England, as a part of the settlement movement. For her, all of life was a learning experience. 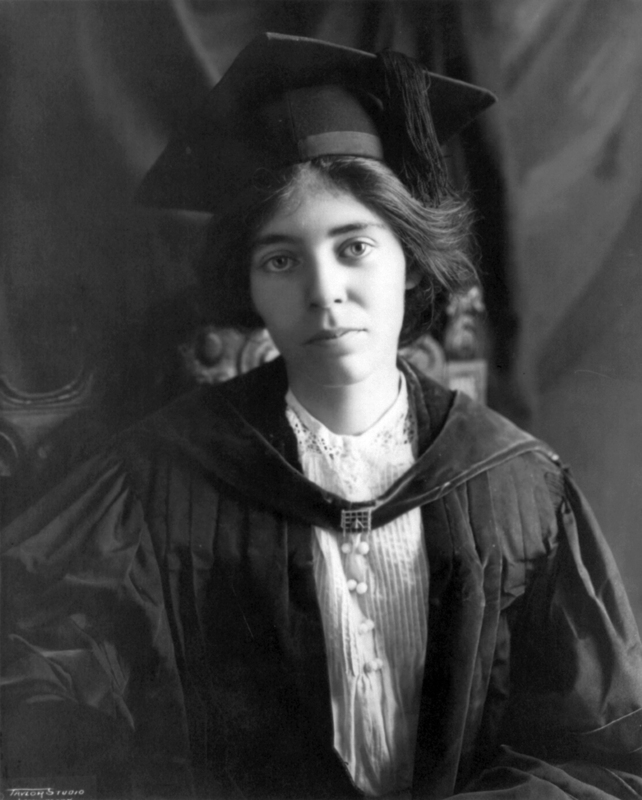 Alice Paul, circa 1913, after completing one of her advanced degrees. 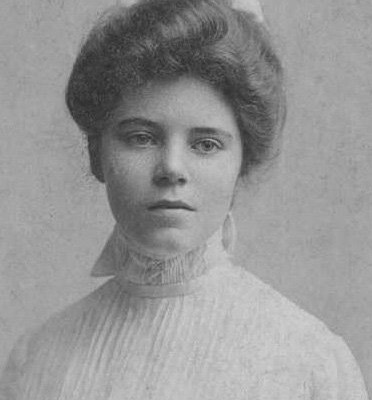 Alice Paul had spent two years working in the settlement movement in New York, but jumped at the chance to move to England and to study social work in Birmingham at the Woodbridge Settlement. That move would radically change her approach to social issues, her idea of the effectiveness of social work, and the course her life would take. Alice Paul would soon become a militant suffragist. Although stories vary as to how they met, Alice Paul made quick friends with the mother-daughter suffragists, Emmeline and Christabel Pankhurst. In her three years in England, Alice was transformed from a quiet Quaker farm girl to a strong-willed advocate for women’s right to vote with a tenacious spirit – in part strengthened by multiple trips to jails in England. Her hunger strikes in British jails led to cruel forced feedings which were more damaging to her body than the actual hunger strikes, and the companionship of women committed to a cause that crossed international boundaries. British suffragist Lady Emmeline Pethick-Lawrence and Alice Paul. Alice Paul recognized one fatal flaw in the American women’s suffragist movement. It was dying as a result of tactics that were too passive. Fighting a real woman’s fight would take more mettle than the movement had shown. She returned to the US ready to put the lessons she’d learned into action. 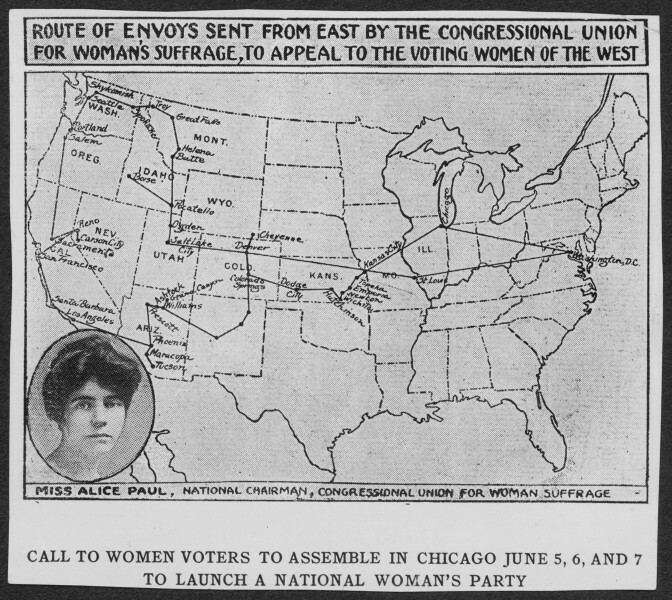 Alice Paul made some noise when she got back to the US. When Alice Paul came back to the United States in 1910, she returned to academia, where she completed her PhD in Sociology at the University of Pennsylvania. By 1912, she’d launched fully into a career as a suffragist and joined the National American Woman Suffrage Association (NAWSA), where she quickly encountered the flaw she’d noted while in England; passive and conservative tactics that wouldn’t lead to quick results. Alice Paul was set to revolutionize politics for American women. 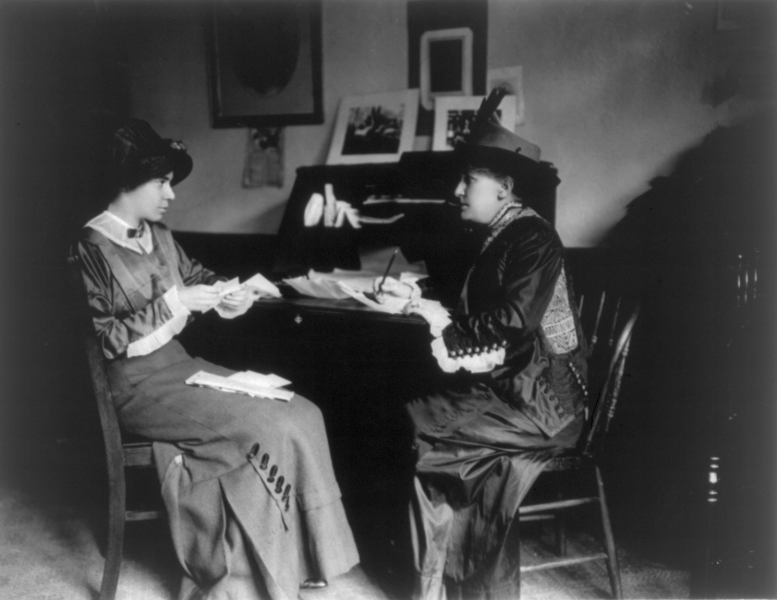 Alice Paul with activist and writer Helen Gardener. The parade’s date was no accident – Alice Paul recognized that President Wilson was key to the suffragist movement. She wanted to focus her efforts on him directly. Her approach wasn’t universally appealing. When Alive took over, the Congressional Union’s main goal was to gain the passage of a federal amendment for woman suffrage. She decided to split the organization from NAWSA in 1914 and surrounded herself with likeminded suffragists who were ready for more immediate change. They were willing to face extreme conditions, abuse, and slander in order to pass women’s suffrage. 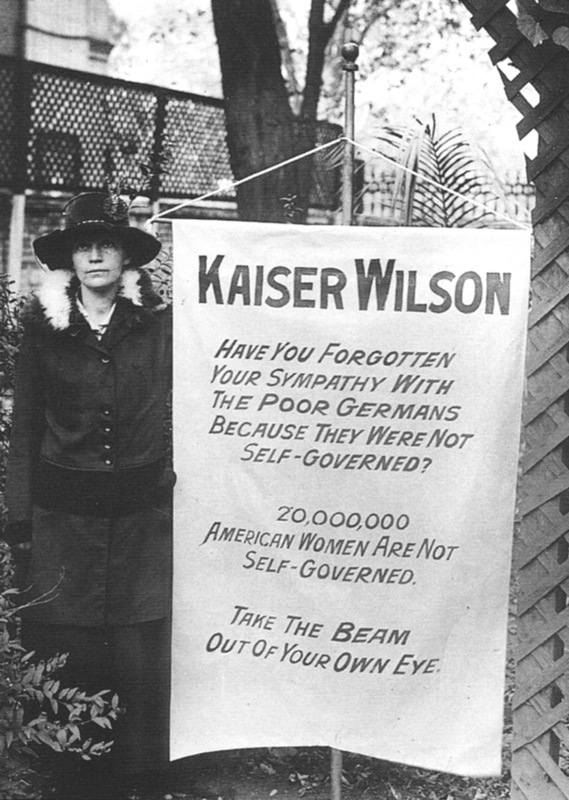 A Slient Sentinel holds a banner addressing President Wilson in a way we bet he didn’t like. At first, Alice Paul’s picketers were treated as a curiosity. A passing fad, perhaps. Bystanders got used to them, waved greetings, nodded, and went about their business. When the United States entered World War I, however, Alice’s tactics gained new and harsh criticisms from a public that viewed them as distracting from the ‘real’ issue – the war. She managed to greatly irritate the President and some sectors of the public, which landed her and her fellow picketers in prison on charges like “obstructing traffic” for which they were fined and refused to pay. Oddly enough, this might have helped her cause. It was a rough fight, but they didn’t falter. By November of 1918, all of the women were freed. Shortly after, President Woodrow Wilson voiced his support for a women’s suffrage amendment. Alice Paul’s tactics, combined with the softer efforts of NAWSA, Carrie Chapman Catt and other suffragists, persuaded President Woodrow Wilson to make the amendment a wartime priority. They also changed the future of picketing forever – charges against Alice Paul and her nonviolent civil disobedience were on trial in a U. S. Court of Appeals. The case was thrown out, and opened the door to future generations of protestors – now a common sight in front of the White House. Victory was sweet, but Alice Paul wasn’t done fighting. At 37 years of age, she obtained a degree in law with one specific goal. 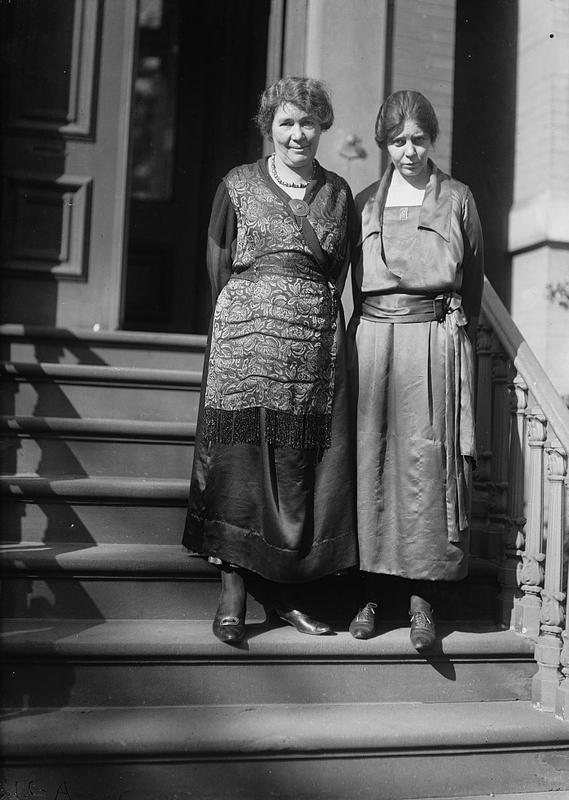 Alice drafted the first version of the Equal Rights Amendment in 1922 – a measure which has still NOT been passed. She fought for the inclusion of an Equal Rights Amendment to prevent discrimination based on gender in the US until forced to retire in 1972 based on her failing health, and also fought to see gender equality measures included in the UN Charter. 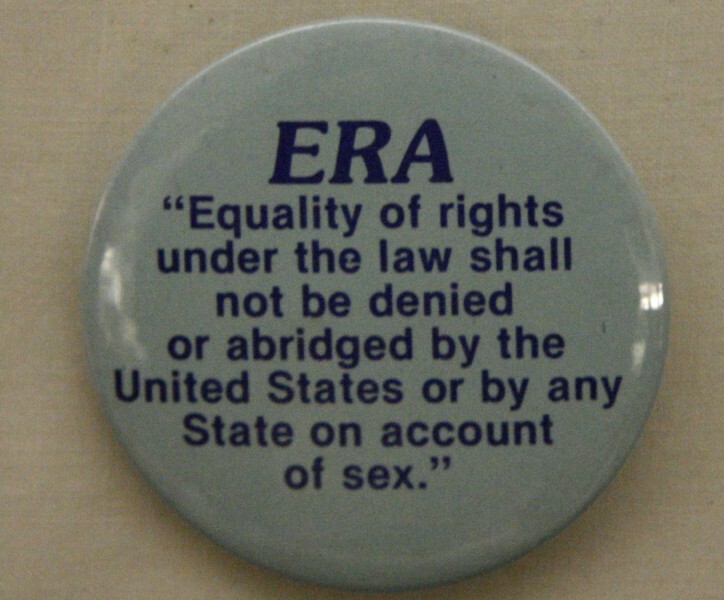 But the Equal Rights Amendment Alice dedicated the last part of her life to has become a topic for debate and divides feminists and politicians. Unlike her suffrage success, it still hasn’t been ratified nationally, although many states have chosen to ratify it. Button showing the ERA amendment. Photo by David on Flickr.